An article in the Washington Post about Big Brown and today's Belmont Stakes sparked an old memory. Not about the race--I've never followed the sport. 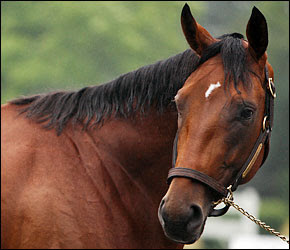 But the picture of the horse--beautiful, noble, majestic--brought me back to childhood days and my best friend, Leslie. Leslie was a horse fanatic. She started off with the first Black Stallion book and eventually collected and read the entire series. In addition to ballet classes, she cajoled her parents into horseback riding lessons and all the gear--red jacket, off-white breeches, black helmet, crop. Her passion for horses and riding overflowed into our friendship--although I was never as into the whole horse thing as much as she was. Oh sure, I read The Black Stallion. The first book, anyway. While Leslie devoured the entire series, I was more into the Nancy Drew collection. And of course I read Black Beauty (Has anyone NOT read Black Beauty?). And I went along with my obsessed best friend pretending to take "riding lessons" in her front yard. We'd set up small folding chairs with broomsticks across them for "jumps." We'd practice cantering, trotting, galloping on our imaginary horses. We'd invent entire stables of wild palominos, exotic Arabians and dappled Appaloosas. We'd give them romantic girlie names like "Mystic Dreams" and "Majestic Wind." In retrospect, Big Brown sounds poetically euonymistic compared to the overwrought appellations with which we dubbed our imaginary ponies.